In a few years, you could buy a hybrid supercar from Mercedes that puts out over 1,000 horsepower and has a top speed well over 200 miles an hour. You could, that is, if the car didn't cost nearly $3 million. And if all 275 that will ever be made hadn't already been sold. The Mercedes-AMG Project One, unveiled in Germany just ahead of the Frankfurt Motor Show, is just a concept car for now. But Mercedes promises a production version will be available for sale fairly soon. Only 275 will be made. The two-seat car's hybrid engineering is based on modern Formula 1 racecars. "Our highly efficient hybrid assembly stems from motor racing and the electrically powered front axle generates a fascinating mixture of performance and efficiency," Mercedes board member Ola Källenius said in a statement. "With a system output of over 1,000 horsepower and a top speed beyond 217 mph this hypercar handles exactly as it looks: it takes your breath away,"
The car was created by engineers from Mercedes' AMG performance subsidiary. It has a small 1.6-liter turborcharged V6 engine and a total of four electric motors. One electric motor helps spin the car's turbocharger, another is connected directly to the engine and two others drive the front wheels. On most cars, turbochargers are spun by pressure from the engine's exhaust. They push air into the engine, allowing it to produce more power. In the Project One, a 120 horsepower electric motor can, when needed, help spin the turbines, providing quicker response. The V6 engine, which is mounted behind the car's two seats, can run at up to 11,000 revolutions per minute, much faster than an engine in a typical passenger car. It is assisted by an attached 161 horsepower electric motor. Two other electric motors, also producing 161 horsepower each, drive the front wheels. Each front wheel is powered separately, allowing different amounts of power to be sent to each wheel. That helps with handling in fast curves, for instance, where more power can be sent to the outside wheel which usually has more grip. The rear wheels are driven by the gasoline engine through an eight-speed transmission. 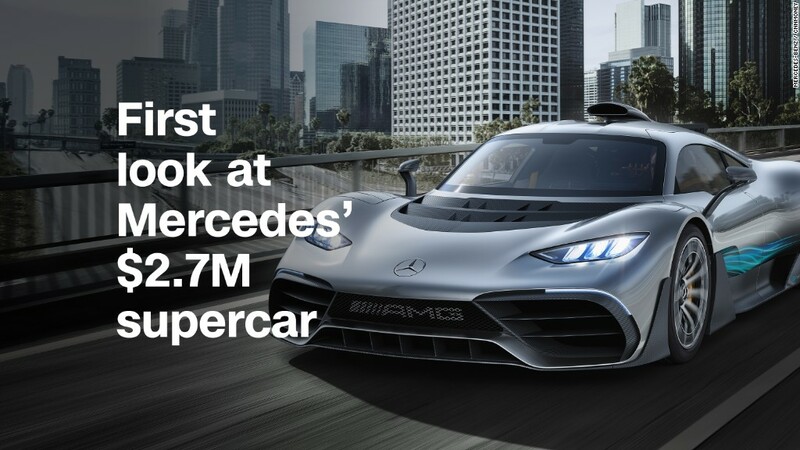 The car's top speed will be something over 217 miles an hour, according to Mercedes, and it will be able to accelerate to 112 miles an hour in under six seconds. That's quicker than a typical passenger sedan can get to just 60 miles an hour. The plug-in hybrid car will be able to drive under electric power alone for about 16 miles before it needs to rely on power from the gasoline engine. At that point it will run like a hybrid car, alternating between gasoline power and electricity stored up during coasting and braking. The driver will be able select various driving modes in which the car will operate either very efficiently or for maximum performance. The production version of the car is still under development and Mercedes isn't saying when the $2.7 million vehicles will be delivered to their owners. You might still own a little of it, though. 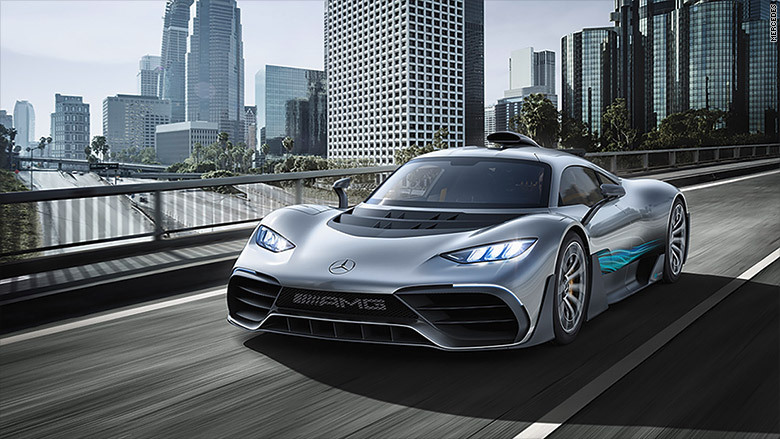 Some of the technology that has been developed for the Project One will be used in other Mercedes cars in the future, the automaker said.